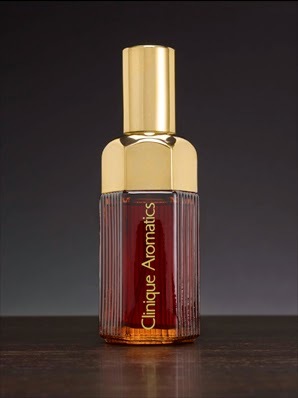 Aromatics Elixir by Clinique had been around for 20 years by the time I discovered it in the early 90s. I started off admiring it from a distance: even the most tentative spray hurled a lavish, densely-packed cloud of flowers, moss and woods into the air around me. I wasn't sure I could deliver on the promise of this perfume. I began smelling AE on people I admired, creative, fiercely intellectual yet playful women who designed operas, archived films, curated art. I finally claimed it for my own a few years ago after hungrily sniffing at the voluptuous haze lingering around a friend. When she told me it was Aromatics Elixir, I understood for the first time how this juggernaut of rose, jasmine, and patchouli transforms the skin into an enchanted forest. The smell out of the bottle is not the perfume on the body. This juice needs skin and heat to make it sing. It takes only one spritz of AE on the small of my back to send tendrils of witchy mystery out into the world. The initial denseness is dissipated by air and time. Aromatics Elixir is a siren song muted by melancholy, my favorite flavor of mood. I especially love its abundant ylang-ylang, which smells lascivious and feral. Perfumer Bernard Chant's masterwork may have been launched all the way back in 1971 (in the original "apothecary" bottle seen in photo above), but I've been tickled to encounter the occult allure of Aromatics Elixir in more recent releases. Le Labo Ylang 49 is a brother from another mother, with perfumer Frank Voelkl swapping AE's rose for gardenia. And with Kinski, perfumer Geza Schoen takes AE to a party and gets her stoned on weed. Whenever I wear Aromatics Elixir, it shimmers in the air around me. I know I smell good in it. My favorite Aromatics Elixir compliment ever came from a friend as we ambled through a park. For jtd's insightful analysis of Aromatics Elixir Perfumer's Reserve limited edition, click here. I have a bottle of AE, but I rarely wear it. It smells wonderful on other people, but I don't know if it's for me. Maybe the small of the back trick is worth a try. "Burying" it is the key here. Back of the knees is another fine launchpad for this big beauty. This trick really works! I've been wearing AE now much more often and it smells wonderful on me now. I love wearing it to bed. So relaxing and beautiful. Might try this trick with other perfumes I have that smell too strong on me. Superb! Glad you were able to sneak this luscious number back into your life. Applying perfume to the back of one's knees or to the small of the back is much sexier than just applying it to the wrists. I will be doing this with everything all the time now. It always smells Christmassy to me. Sophie, the one that always smells Christmassy to me is Etro Messe de Minuit - the current one that's very pot-pourri. Hello! I have been wearing this, but recently it's become almost harsh and definitely overpowering (not that overpowering usually bothers me, if it's something I like...). I have the Perfumers' Reserve too (the black bottle), which is still behaving beautifully. Is it possible that the original regular one has gone off? Meanwhile, 'siren song muted by melancholy'....now there's a theme for a next post; I'd love to see what others you put in that category! Hard to know from where I'm sitting if yours has gone off, but I agree that the full nose-to-just-sprayed-wrist effect can be harsh. I never fully engaged with the Perfumer's Reserve, though I do have in my possession the solid perfume version in a locket. Your enthusiasm reminded me that I need to give it a good wearing. I've missed you, Katie! Although I consider most scents gender neutral, this AE you describe sounds ultra feminine. Regardless, your reviews are always a pleasure to read and watch, and you always expand my fragrance awareness. Thank you! Aw, thank you, Randy! As for my feminine characterization of AE, it has more to do with my relationship with the perfume, and what it evokes for me, than the actual smell. In fact, AE is one of the more gender neutral 'fumes out there, especially since Bernard Chant's identical twin rendering of it for Aramis - Aramis 900 - is sold at the men's counter. And as mentioned, the recent Kinski is aimed at the lads, despite it having a passing whiff of similarity to AE. 'Some tree was me' hahaha. I loved the bit about 'tendrils of witchy mystery' - it is absolutely that. I recently met a lady, the widow of an artist, who lives in a beautiful barn conversion in the country crammed with her late husband's avant-garde paintings. She had a number of vintage perfumes on her dressing table including this, her signature scent. I will always associate AE with her now, as she and her house were so distinctive. Hi Vanessa! That's quite an evocative word-painting of your new friend. Sounds like a wonderful lady to spend an afternoon with, Vanessa. I can imagine she would have so many interesting stories to tell, and her home sounds absolutely divine. That warms my cockles, Justineantonia! Thank you. I should also have said, I used to love AE, but of more recent years I up-levelled to Daphne by CDG, which I think is AE's richer, battier older sister? Daphne is battier by far, but I think she squandered her millions on too many ill-fated holiday romances. I go in and out of desiring Daphne, and then getting yakked out once I tune into the coconut. Once I locate it, I can't un-smell it. But there's something about the incense/tuberose/patchouli juxtaposition that I lurve. Haven't tried Misia yet, but hope to tomorrow! How great that a perfume is named after Misia Sert, the artists' patron and muse of the Gay 90s and beyond. I never comment here, but I always follow you. I have missed you! Regarding Aromatics Elixir, I always do the same as you, spray in the small of my back, but before bed. It feels like I'm falling asleep in an enchanted forest, I love it! Hi The Countess, I sure appreciate your follow-ship! The good thing about pre-bed perfume application is that your sheets retain the subtle trace to fragrance your dreams. Would you consider Aramis by Aramis as the Aromatics Elixir for men? It sure is, and I sure do. Sometimes I wear it! Depends on climate and occasion. If it's hot/humid, and you're in close confinement with others, a couple of sprays will suffice. I want to join in with everyone else and say how happy I am to see you back to writing perfume posts, Katie. Hope it doesn't sound weird to say this, having never met, but I think you are just lovely. Nora! YOU'RE the lovely one! I feel your warmth from here. Thank you. Hi Pinkcash! Hooray for you being here for me - thank you! For years, I thought I hated it, smelling it from the bottle every once in a while (I suppose, to see if it still repelled me... it always smelled like scented toilet paper to my nose!) I've been learning more about perfume over the last few years so I decided to give it a shot- on the skin this time. Oh my God, I couldn't believe how wrong I'd been all those years. I immediately bought a bottle of it and wear it just as you described- a little bit on the small of my back and it's perfect. I live in the Southeastern U.S. and it's been wonderful during the hot, humid summer. Hi Amanda - your welcome feels good. Ooh yeah, scented toilet paper - do they still make that? Yes, Aromatics Elixir is magical. If you can control the juju, you can truly cast a smell spell with this perfume. I remember scented toilet paper from childhood! The brand was Aurora, and Krizia Teatro alla Scala is the closest thing I've found to it. Hi Katie. As a gay man, I can tell you that to date, Aromatics Elixir is THE only perfume that makes my head turn when the woman wearing it walks past. It is bewitching and intoxicating. You may be aware (you may not) but Aramis 900 for men offers a very similar angle but for the chaps. They certainly have the Rose, Jasmine and Vetiver in common. Carl. Oh yeah baby, I'm well aware of the Aramis 900 connection. It's a beaut! Hi there Katie, what a delightful piece this is on Aromatics ElixirI I have had similar exxperiences with this beast, but have gotten through both a Vintage bottle and the Private Reserve was sniffing around for some advice about vintage vs new and you popped up, how fortuitous!